Full of satisfying and stimulating surprises, Angelica Sanchez's music affords a refreshing new take on creative improvisation. In her hands and those of her skilled collaborators, this thoughtful and playfully inquisitive set presents adventurous music in which we can "see" some of our own selves. Newcomer Sanchez combines the fluidity and drive of "classic" Paul Bley and John Taylor with the adventurous storytelling color of Cecil Taylor. Her compositions tell engaging stories spurred on by her own ear-tingling playing and the egoless interaction of her top-flight NY improvisors quartet including tenor powerhouse Tony Malaby, bassist Michael Formanek, and drummer Tom Rainey. This may be one of the most important jazz piano debuts in years. Buy Mirror Me now at the OmniTone store. 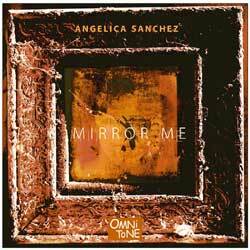 Angelica Sanchez's compositions are published by Sancha Music (SESAC).